I had planned to do some dye talk, but the grumperina’s tagged me with a meme that I’m actually going to do! Dyeing and other knitting talk tomorrow. What is your all-time favourite yarn to knit with? This was actually really difficult for me. But, since I always go back to it, I think the winner is going to be Brown Sheep Cotton Fleece. Projects I’ve knit with it: 2 wavy skirts (one for the store and one for me), sideways spencer, cavern cardi…I think there are others, too. Denise! Addis are just too slippy and dull-tipped for me (not to mention expensive). And I love, love, love Garnstudio’s bamboo circs, but I think they’re discontinued. Probably Sonnet from knitty. It was my first sweater, and I used bulky wool/acrylic. Didn’t know a damn thing about seaming, especially setting in sleeves in garter stitch! It was promptly frogged. Hm. Sideways spencer was fun to knit. I wouldn’t do it again, but it was fun. Laddering down to fix a mistake! And not being afraid to frog. I love Interweave Knits. As for a book, I haven’t really got a favourite one. I think I only did one knit-a-long ever, for a kitty hat. I’m not really a KAL-er, although I do like watching from the sidelines. grumperina, Almost Felted, Yarn Harlot. I read a LOT of blogs though, and there are a few more I’m really into at the moment, especially Whispering Pine and See Eunny Knit. 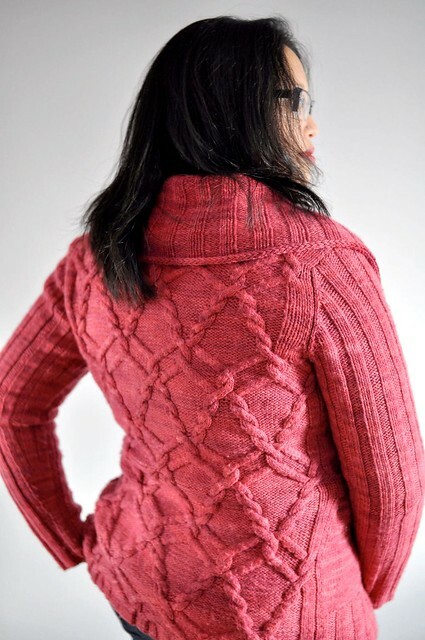 I really love Teva Durham’s style and I’ve knit a few of her patterns, but I find most of it’s just too bulky. Other than her, I can’t think of anyone at the moment other than Elizabeth Zimmerman! No time for a picture right now, but of the sweaters it’s gotta be the Must Have cardigan. I wore it yesterday, as a matter of fact! I also wear my Silken Clapotis a lot too, although it’s getting rather fuzzy. Let’s see…how about Felicia, Lauren and Dani! The cosmicpluto speaks! Thank you for answering the meme. I’ve always eyed Brown Sheep Cotton Fleece, mainly for it cotton with a bit of wool content, and perhaps it’s time to give it a try, thanks for the tip! Thanks for the insta-content. How do you launder Cotton Fleece? Anyway, I like your blog because you post frequently, never talk politics or ‘worthwhile’ causes, knit lots, knit well, knit creatively, share tips, expertise, and patterns, show lots of photos, and share only enough of your personal life to make you a real person. Thanks for all you do to encourage knitting and knitters.